Yard sales can be a lot of fun and most folks love it when they get a good deal on something, however if you aren’t careful with your purchases at yard sales you may end up with a trunk full of stuff you don’t really want. Below are a few ideas on what NOT to buy at the next yard sale you attend. Electronics may seem like a good thing to buy at a yard sale because you can typically get a super duper deal on them. There typically is a reason why things are so cheap at yard sales and the reason might just be that the electronic in no longer in working condition. It is a good idea if you do decide to purchase an electronic at a yard sale that you test it out before you leave the sale. Many times the owners of the product will be happy to allow you to plug it in to see if it works. If the owners of the electronic at the yard sale are not quite so accommodating, it’s best to just leave the electronic there and purchase it new at the store. Another thing you may not want to purchase at a yard sale are things for your baby such as car seats and cribs. Many times these types of items have been recalled and since there is no way of knowing which ones may or may not be on the recall list, purchasing new is always the best way to go. Yet another item you may not want to purchase at your local yard sale is make-up. While we all love to get a good deal on some make up, think about where that makeup may or may not have been. 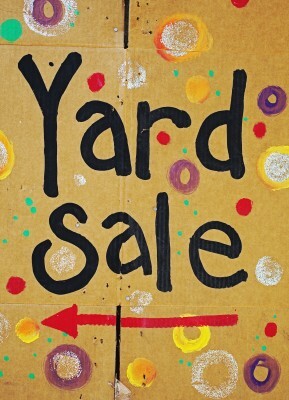 Most times you don’t personally know the folks having the yard sale where you are purchasing your items and therefore you don’t know how clean they are. It is best if you want to buy used make-up that you purchase it from a close relative or friend. These are just a few ideas of some things that you may not want to purchase during your next yard sale adventure. Some things are just better bought fresh from the store even if you have to pay three prices for them. Summer is officially over and that means it’s time to clean out your house and get rid of things you don’t need. This is the time of year that yard sales abound. Some yard sales are more profitable than others and there are many reasons why that is so. 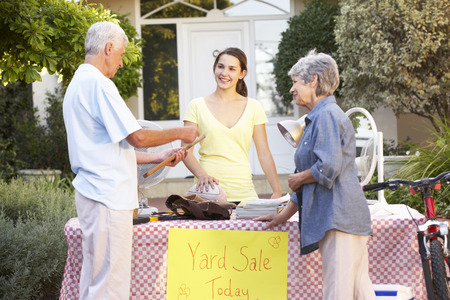 Below are a few tips for a successful yard sale. 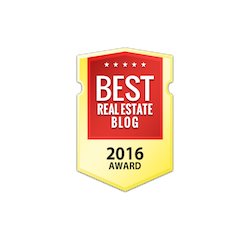 Courtesy of Montgomery AL Realtor Sandra Nickel Hat Team. Garage, yard, or estate sales might not be your preferred locations for finding that special jewel for your Montgomery AL home or for resale on eBay or Craig’s List, but it can happen, especially if you’re prepared, patient, and persistent. Think of such a search as a treasure hunt that well may provide fun (or extra cash) for the family, hone your negotiating skills, present you with a challenge, and even result in the discovery of a “rare” find. Be prepared: Check newspapers, community bulletin boards, curbside signs, and local newspapers for times and locations near your Montgomery AL home. Use on-line sources to augment this type of information. Map out the most efficient route before you start out. It is also helpful to be aware of the “going prices” for many items, info you can find on eBay Pulse or Yard Sale Search. Have a general idea of how much you can afford to spend. Wear comfortable shoes and bring lots of $1 bills! Best times to browse: at the very beginning or at the end of the day. Know what to buy: 1). Wood furniture that is in good shape and can be rejuvenated with a new coat of paint is nearly always a good bet, yard sales gurus say. Do consider size in terms of fitting in the perfect spot in your Montgomery AL home and in transporting the item. 2). With many books selling for $1 or less, yard sales are the perfect place to stock up on beach reads or volumes for resale. 3). High-end clothes can be found if you’re looking in an upscale neighborhood. Whether you're buying clothes for yourself or for resale purposes, examine them carefully for rips and stains and avoid anything that smells of smoke! 4). “Paintables” are items that can be transformed with paint. Lamp bases (and yes, even the shades), glass bottles and jars, baskets, and pieces of pottery are all ideal candidates.5). Young children’s clothing and games for kids of all ages. Remember these caveats: Resist the urge to buy every bargain you see so you don’t overload your own Montgomery AL home. Avoid upholstered furniture and/or mattresses which may carry bugs. Be wary of used electronic gadgets unless you know what you’re doing. Stay away from bike helmets, child car seats, or cribs which may not meet current safety regulations. Ready? Grab your map, your pricing guide, your wallet, and your list of desired treasures. Set out to have a good time, and Go!